Before you can run an Excel® add-in on a MATLAB® Production Server™ instance, you must configure it. In Excel, select Add-Ins > Configure MATLAB Production Server. 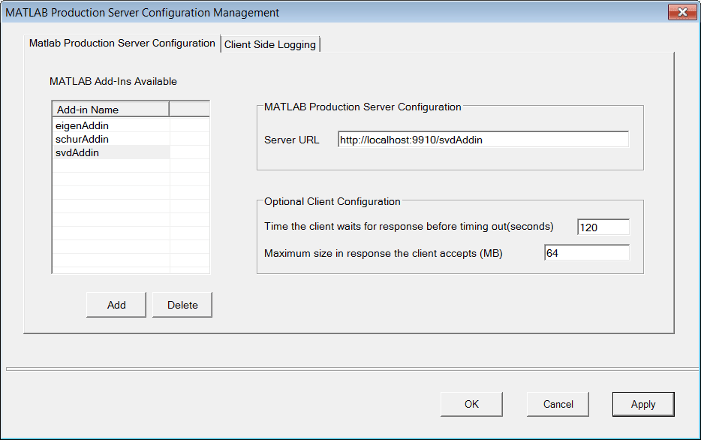 Select the MATLAB Production Server Configuration tab. Select the add-in to configure. The server URL corresponding to the add-in displays in the Server URL field. If the add-in is not listed, click Add under the MATLAB Add-ins Available table. Enter the name of the add-in, and click OK. If the Server URL field is empty, enter the URL based on the application protocol you want to use: HTTP or HTTPS. A server certificate must be installed in the certificate store of the client or local machine running the Excel add-in when using HTTPS. Modify the Optional Client Configuration options if necessary.